Indeed, the paradoxical nature of the notion that an inert treatment could produce a therapeutic effect may help to explain its curious appeal. Since placebos are physiologically inert, any effect they might have would be through the patient’s mind. In the case of patient-reported outcomes, psychological explanations for placebo effects — for instance, that the experience of receiving treatment helps produce a sense of well-being, or that the expectation of improvement can encourage it — are indeed plausible. But the placebo effect has also often been touted as applying to objective outcomes, and interpretations of its mechanism have tended to focus on exotic notions of the mind’s ability to heal the body. There is something intriguing and comforting about the idea that the mere belief in the effectiveness of a treatment could make it effective. And the mystical aura surrounding the placebo effect may have indirectly contributed to the popularity of alternative medicines and therapies, which are often promoted as tapping into the body’s hidden potential to heal itself. But there is also something morally troubling about the use of placebos in therapeutic settings — after all, much of their effectiveness would seem to depend on physicians withholding information from their patients, or even lying to them. The popular and technical literature about the placebo effect remains littered with errors and confusions, and the very volume of that literature seems strange since there is so little solid evidence demonstrating the effectiveness of placebos. In the wake of research showing that placebo effects are neither as large nor as widespread as previously believed, clearer thinking about placebos is long overdue. A woman fancying she had swallowed a pin in a piece of bread, cried and lamented as though she had an intolerable pain in her throat, where she thought she felt it stick; but an ingenious fellow that was brought to her, seeing no outward tumour nor alteration, supposing it to be only a conceit taken at some crust of bread that had hurt her as it went down, caused her to vomit, and, unseen, threw a crooked pin into the basin, which the woman no sooner saw, but believing she had cast it up, she presently found herself eased of her pain. The idea that the mind has powers to heal or harm the body has been prominent in various religious and philosophical traditions and today still has a widespread following, surely contributing to the ongoing popularity of the placebo effect. Ordinary life experience would seem to support this notion, providing ample evidence that our mental states can influence our bodies and sensations. Our emotions are generally accompanied by physical manifestations, such as flushed cheeks when angry, sweating when nervous, and trembling when scared. Under the right conditions, whether by accident or through trickery, people can have experiences that turn out to be illusory. Psychosomatic aspects of illness including the effects of stress have long been a focus of investigation. It is not surprising that efforts have been made to exploit such factors therapeutically, for instance through psychotherapy or techniques such as distraction to lessen pain. It is well known that psychological phenomena like expectancy and classical conditioning can have physiological effects. In recent years, studies have investigated the neurological basis of such effects. In experimental settings, receiving a placebo has been linked with endogenous opioid production, and a recent study published in The Journal of Physiology found evidence that a placebo can induce changes in brain cells of patients with Parkinson’s disease who had previously received a real Parkinson’s drug. Although these studies hint at neurological mechanisms that may underlie psychological effects, they do not demonstrate clinical effectiveness of placebo, much less a more general placebo effect. A positive outlook cannot cure cancer, but in the case of more common complaints, we tend to suspect that people who are melancholy, who complain a lot, or who ruminate obsessively about every fleeting symptom may in fact be making themselves sick. In contrast to the flimsy research linking attitude to cancer survival, there are scores of studies showing that happy or optimistic people are likely to be healthier than those who are sour-tempered and pessimistic. Most of these studies, however, only establish correlations and tell us nothing about causality: Are people healthy because they’re happy or happy because they’re healthy? Ehrenreich does not consider another possibility, known as “confounding”: maybe people are happy and healthy due to a third factor. For example, it might be that exercise makes you happy and it also makes you healthy. If this were the case, then happy people who don’t exercise may not be particularly healthy. In any case, Ehrenreich’s point stands: associations between health outcomes and attitudes or beliefs do not establish causation. Nevertheless, the connection strikes many people as intuitive. Another type of mind-body interaction is simply the product of behavioral change. It has been suggested that the whole context of patients’ therapy — including their sense that they are taking action to improve their health, their relationships with medical practitioners, visits to clinics or hospitals, and therapeutic rituals — may encourage them to make other changes. Patients’ experiences can influence their behavior, which in turn may affect their medical outcomes. This type of mind-body interaction is quite lacking in mystery. The question of whether it manifests as a significant placebo effect in particular contexts is another matter. But if behavioral change can affect health outcomes, the focus should be on identifying these behaviors, not on placebos. Whether or not placebos affect the body through the mind, they are an essential tool for evaluating medical treatments; a placebo can provide a comparison case for a therapy being tested. Perhaps some of the earliest placebo-controlled experiments were performed in late-eighteenth-century France in order to evaluate mesmerism — Franz Anton Mesmer’s controversial “magnetic” therapies. Mesmer was said to have great success treating a wide variety of ailments using therapies based on his theory that a kind of magnetic fluid connected the planets, including Earth, and all living things, such that their motions influenced one another and could be manipulated with magnetic objects. Iron rods and even water and trees could be “magnetized” and then in turn be used to magnetize people, bringing about convulsions, fainting, and cures. 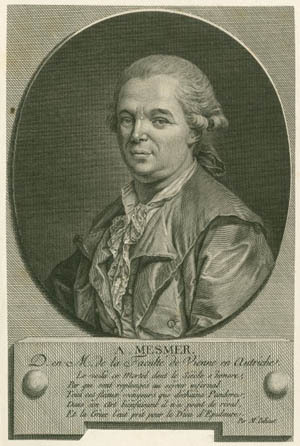 After running afoul of the medical establishment in Vienna, Mesmer moved to Paris in 1778 and built a lucrative practice applying his treatments. As the popularity of mesmerism grew, so did the controversy surrounding it. In 1784, King Louis XVI ordered a commission to investigate the scientific validity of Mesmer’s practice. Among others, the commission included the great chemist Antoine Lavoisier and the renowned scientist and American ambassador Benjamin Franklin. But what to make of the apparent cures brought about by Mesmer’s techniques? The report remarked that it is nature that “cures the diseased” but that “sometimes she encounters obstacles,” which the physician, as “the minister of nature,” helps her to overcome. Franklin, in a different letter in which he commented on these investigations, wrote that there are “so many Disorders which cure themselves, and such a Disposition in Mankind to deceive themselves and one another on these Occasions.” This same point would be made again in the middle of the twentieth century when Beecher’s paper was published: the effect attributed to a placebo may really be nothing more than a change in the disease’s natural course. Preservation of sound judgment both in the laboratory and in the clinic requires the use of the “double blind” technique, where neither the subject nor the observer is aware of what agent was used or indeed when it was used. This latter requirement is made possible by the insertion of a placebo, also as an unknown, into the plan of study. no experiments on the placebo response itself have included control groups that receive no treatment whatever. This is a serious flaw in current medical research design and should be corrected if future results are to be validly interpretable. Liberman believed that the placebo effect itself was real, and his paper endorsed the idea, including the claim that “Placebos can ‘produce’ objective physical changes also.” But he was aware of some of the shortcomings of research on the placebo effect. Unfortunately, his words of caution were largely ignored. One source of evidence seems directly to support the placebo effect: in many randomized placebo-controlled clinical trials, placebo recipients tend to experience improvements in their conditions. Sometimes the improvement is substantial. At first sight, this might suggest that the placebo is responsible. But this is not necessarily so. Consider osteoarthritis of the knee. Until recently, one common treatment for this painful and debilitating condition was arthroscopic surgery. However, a study published in the New England Journal of Medicine in 2002 showed that patients who received either of two different versions of this surgery showed no greater improvement than patients who received “sham surgery,” a type of placebo. The sham surgery involved incisions being made but without removing debris or smoothing joint surfaces. The study authors noted that these findings raise the question of whether “the billions of dollars spent on such procedures annually might be put to better use.” Indeed, a subsequent study in 2008 showed similar findings, and a 2009 recommendation paper stated that “For most patients with osteoarthritis of the knee, arthroscopic surgery offers little benefit.” This is an important result: a widely used treatment has been shown to be ineffective. But an article in Scientific American expressed the result of the 2002 study in a different way: “Surprisingly, sham surgery seems to alleviate painful symptoms just as effectively as the real operation does.” This is a very subtle misinterpretation of the study’s findings. The study does not provide any information on how effectively sham surgery alleviates painful symptoms. The sham surgery was only used as a comparator so that the effectiveness of the real operation could be determined. What the Scientific American article was presumably referring to was the fact that patients generally reported modest improvement in pain following surgery, whether real or sham. This is an interesting observation, but it is not necessarily evidence of a placebo effect. The study authors commented that they had demonstrated “the great potential for a placebo effect with surgery, although it is unclear whether this effect is due solely to the natural history of the condition or whether there is some independent effect.” In clinical trials the placebo is used to examine whether treatments are actually effective, yet ironically when no effect is found — when treatment and placebo yield similar results — people will sometimes conclude that the placebo itself is effective. As the authors of the study noted — echoing the earlier comments by Liberman and, nearly two centuries before him, Benjamin Franklin — one reason patients in the placebo group may improve is simply that, on average, many conditions show some degree of improvement over time. In a placebo-controlled drug trial on acute common cold, described as mild and of short duration, 35% of the patients receiving placebos felt better within 6 days (2 days after the onset of placebo administration). Beecher interpreted these improvements as an effect of the placebo administration. However, he did not consider that many patients with a mild common cold improve spontaneously within 6 days. This is a very common mistake also in other literature about placebos: A 20% placebo effect is claimed for a placebo-controlled drug trial on patients with angina pectoris. However, in the same trial, 72% of the placebo-treated patients deteriorated. A subtle but significant phenomenon known as “regression to the mean” can also show improvements that are often mistaken for a placebo effect. Consider how patients are recruited into clinical trials. To be eligible to participate, patients must have a certain severity of illness. In the 2002 osteoarthritis study, for example, patients had to have moderate knee pain or worse — at least a 4 on a scale from 0 to 10. When pain is assessed a second time, there tends to be a regression toward the mean, which is to say a less extreme measurement. Why does this happen? One reason is that, as already noted, many chronic illnesses show fluctuations in severity. At the time of recruitment into a study, a patient’s illness may be near its worst; when measured again, it is likely to have diminished. Another reason relates to the fact that no measurement is entirely free of error. (And self-reported pain scales, being wholly subjective, may raise particular problems in this regard.) Some patients may meet the eligibility criteria because of a spuriously elevated initial measurement; subsequent measurements are likely to be lower. This point was clearly articulated and demonstrated in a 1983 paper published by Clement McDonald and coauthors in the journal Statistics in Medicine, arguing that “most improvements attributed to the placebo effect are actually instances of statistical regression.” But the paper received little attention, perhaps in part because regression to the mean is notoriously difficult to understand. Kienle and Kiene noted that in some studies patients in the placebo group also received other treatments, which could plausibly explain their improvement. For example, the placebo group in an angina study listed in Beecher’s original paper also received nitrates. What kind of study could produce reliable evidence of a placebo effect? Echoing Liberman’s comment, McDonald and his coauthors in their 1983 paper noted that “conclusive proof of a causal role of placebo treatment requires a controlled trial comparing placebo-treated with non-treated patients.” Attempting to draw conclusions about placebo effects without an untreated control group is what Danish researcher Asbjørn Hróbjartsson calls “the classic methodological error” in this field. In fact, a number of randomized trials with a placebo group and a no-treatment control group have been carried out, and in 2001 Hróbjartsson together with another Danish researcher, Peter Gøtzsche, published a review of 114 such studies, covering a wide range of clinical conditions. Some of the studies measured objective outcomes, such as laboratory data, while other studies measured subjective patient-reported outcomes, such as pain. The authors did not find a statistically significant difference between placebo and no-treatment groups, except in studies of pain treatment as well as in other studies involving subjective outcomes that were measured on a continuous scale — things like anxiety and nausea. We did not find that placebo interventions have important clinical effects in general. However, in certain settings placebo interventions can influence patient-reported outcomes, especially pain and nausea, though it is difficult to distinguish patient-reported effects of placebo from biased reporting. 1) the placebo effect is powerful, 2) the body can automatically respond to taking placebo pills like Pavlov’s dogs who salivated when they heard a bell, 3) a positive attitude helps but is not necessary, and 4) taking the pills faithfully is critical. Even in this “non-deceptive” administration of placebo, it seems that patients have been given some questionable information. This term does not only imply the effect of a placebo intervention as compared with a no-treatment group, but is also used to describe various other aspects of the patient-provider interaction, such as psychologically-mediated effects in general, the effect of the patient-provider interaction, the effect of suggestion, the effect of expectancies, and the effect of patients’ experience of meaning. Generally the conceptual and methodological confusion in the field of placebo is of such a magnitude that references to placebo effects are incomprehensible without further clarification. It might be time to stop using the term placebo effect and instead specify which kind of intervention one is referring to, and how its effect was measured. Among non-specialists, the placebo effect confirms the intuition that state of mind can influence physical well-being, that the world is more mysterious than we know, and that the knowledge of experts is not as complete as they might have us believe. Among the scientifically literate, including science journalists and scientists themselves, the idea of the placebo effect suggests intriguing neurological-physiological mechanisms. For the popular media, it is a perennial favorite that combines the prestige and authority of science with a suggestion of mysterious forces. Ironically, while the placebo lies at the heart of rigorous scientific evaluation of the efficacy of treatments, science journalists are often surprisingly willing to accept anecdotes about the placebo effect at face value and tend to make simple errors in selecting and interpreting evidence. New studies that apparently support the placebo effect are often accepted uncritically, even by scientists. Uncritical acceptance of the placebo effect may be harmful in several ways. It may encourage magical thinking and make people more susceptible to quack therapies. It may also distract attention from the refinement of effective therapies and the development of novel ones. And if health care providers make clinical use of placebos, they may find themselves engaging in deceptive practices, possibly damaging their relationships with patients. Hype about the “amazing” placebo effect says more about the cultural appeal of the idea than it does about solid evidence supporting it. This is a troubling sign that an idea that resonates with experience and cultural meaning may be alluring enough to evade scrutiny, even among scientists. The best evidence indicates that the placebo effect is not a general phenomenon. But at some level it seems that evidence is beside the point; we simply want to believe. Perhaps belief in the placebo effect is itself the ultimate placebo effect. Nick Barrowman is Senior Statistician at the Children’s Hospital of Eastern Ontario Research Institute in Ottawa, Canada. This essay reflects his own views. Nick Barrowman, "The Myth of the Placebo Effect," The New Atlantis, Number 48, Winter 2016, pp. 46–59.